Neera (Shanta Apte) is trapped into marrying an old widower Kakasaheb (Keshavrao Date). He is a progressive lawyer with a son and daughter of Neera’s age. Neera refuses to consummate the union claiming that while suffering can be borne, injustice cannot. Neera faces many hurdles including her aunt-in-law and a lascivious stepson Pandit (Raja Nene). Finally, the widower, realizing the unfairness of the situation, commits suicide thus freeing Neera. Kunku was Prabhat’s first film on a sociological theme and an extraordinary success. It remains one of the finest films produced by the Studio. The film, a bilingual (The Hindi version is called Duniya Na Mane), is based on NH Apte’s Marathi novel, Na Patnari Goshta, which had created a literary stir in the mid 1920s when it was published. Its central character, somewhat reminiscent of Nora in Ibsen’s A Doll House, outraged the orthodoxy. In fact, it is said that Shantaram took up the novel for filming despite his partners’ fear that the film would not only offend traditionalists but would fail to attract audiences. Shantaram went ahead, regardless, and was more than vindicated when the film was both a critical and commercial success. In fact, the film appears startlingly modern in many sequences. Shantaram pares down his narrative to bare essentials and keeps his treatment starkly realistic. In this film as in the other Prabhat films, there is a sure, definite understanding of the medium of sound film, where the visual, the spoken word, the music and the sound effects balance and compliment each other. Shantaram eschews the background music, retaining only natural sounds – effects and voices in his sound track to great result. Even the songs, composed by Keshavrao Bhole used in the film are done so with a source shown for the music and effectively integrated with the narrative. There is however the odd dramatic flourish in the film as in the scene of the old widower dying his hair in front of a mirror, which he smashes in a fit of rage with each piece appearing to be mocking him. Throughout the film telling use is made of a grandfather clock as a symbol for the old widower. When he decides to right the injustice on the young woman by committing suicide, he removes the long pendulum of the clock signifying taking his life himself and uses it as a paperweight for the suicide note he leaves behind. 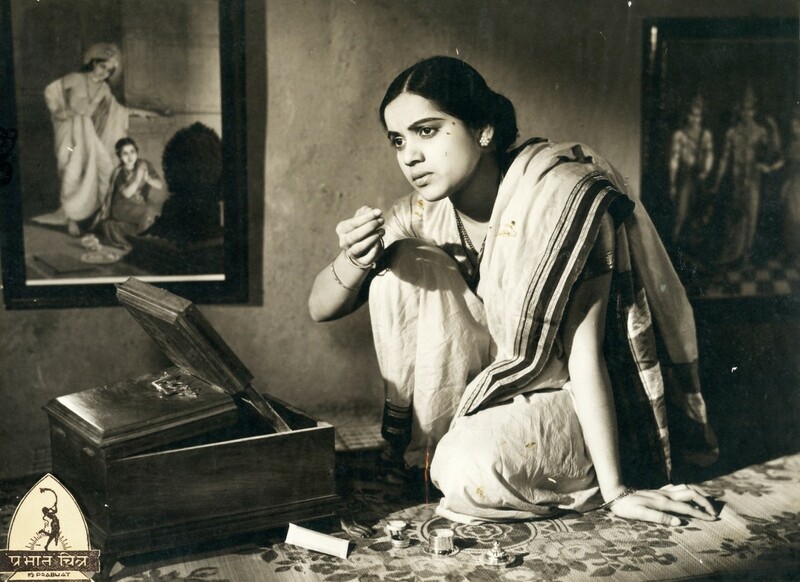 Shanta Apte’s performance in the leading role displays a freshness ahead of its time and established her as a ‘rebel star.’ She is absolutely brilliant in the film and it has to be said that hers is one of the all time great performances in Indian cinema of the 1930s. She even sings a combative song in English in the film – In the World’s Broad Field of Battle… … Be Not like Dumb, Driven Cattle written by HW Longfellow. Keshavrao Date lends perfect support to her fiery act and is spot on as the widower who repents. However, for all the pluses, a major problem in Kunku concerns the film’s ending. It appears from the film that the girl is now finally free. But it leaves the girl a widow in Hindu Society – a punishment and an injustice far worse. This takes away from an otherwise well meaning and hard-hitting, revolutionary film of its time.